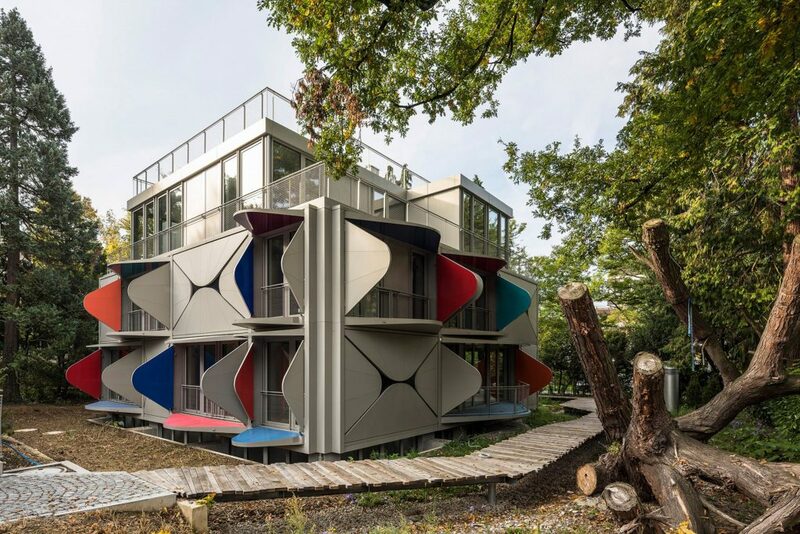 Creating functional buildings that provide shelter from the elements is a given when it comes to architectural design, but some are more innovative and beautiful than others. Here we bring you a selection of our favourite projects incorporating shade from the sun. Architecture and urban planning practice Manuel Herz Architects based in Basel, Switzerland and Cologne, Germany, has created a distinctive and functional private apartment block with ingenious ‘shutters’, Ballet Mécanique sits in lush gardens near Lake Zurich in the city’s Seefeld residential district. The façade includes rounded, triangular, folding shutters or Brise-Soleil, which open to provide shade and balcony canopies. When closed, they darken the rooms and offer intimacy. The outside of the shutters has a uniform, pearly, slightly shimmering colour, so that when completely closed, the house has a uniform hue. Meanwhile, the insides of the shutters are shades are orange, red and blue, so that when open, they create a multi-colored building that beautifully contrasts the garden. 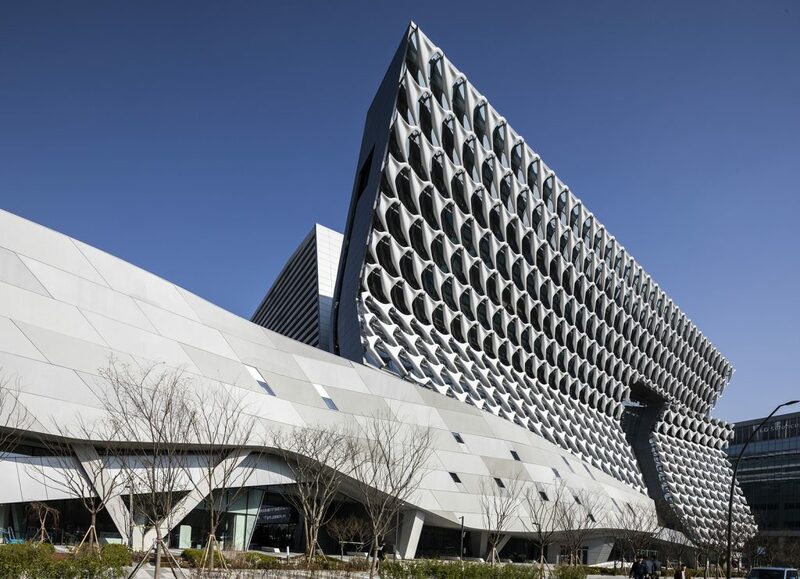 Kolon One & Only Tower is the new state-of-the-art research and development centre for the The Kolon Group, based in Seoul, South Korea. A diverse corporation, whose activities range from textiles, chemicals, and sustainable technologies, The Kolon Group needed a multi-functional building to house not only its R&D facilities but also meeting suites, exhibition space, shop, library, lecture rooms and cafeteria. Designed by Morphosis Architects, the centre of the building ‘folds’ slightly to provide passive shading to the lower floors. A huge amount of thought and planning has also gone into energy efficiency, resource conservation, and environmental stewardship, as well as employee health and well-being with roof terraces, courtyards, and other architectural measures to increase access to natural light and air for employees. Sustainable features include green roofs, recycled materials; and utilizing a ‘bubble deck’ slab that reduces the amount of concrete used by 30%. Henning Larsen Architects aimed to set a benchmark for green design with the university building in Kolding, Denmark. Featuring a climate-responsive kinetic facade that is an integrated part of the building, vital to its unique and varied expression. 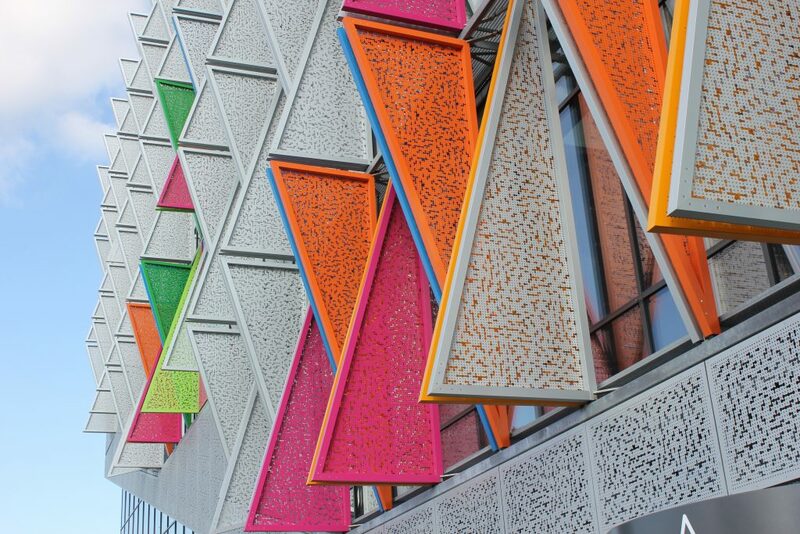 The striking solar screen system consists of around 1,600 triangular shutters of perforated steel, which are adjustable to match the amount of daylight and desired inflow of light at any time. The perforated shutters give a dynamic effect from the outside and an exciting play of light from the inside. NBBJ Architects has created Sunbreak, a new prototype for user-controlled sunshades that it says will lower energy costs and give buildings a dynamic appearance throughout the day. While there’s already technology for automatically regulating sunlight into buildings, shades often go up or down based on the time of day, but if it’s cloudy outside or users want natural light in a room when the shades are down it can be problematic. ‘Sunbreak’ takes advantage of folding geometry, and a movable track system controlled by a mobile app and sensors that can detect when people are present to automatically raise or lowers shades and saves energy during periods when part of a building is unoccupied. If someone is in the space, the shades open automatically to provide users with natural light. 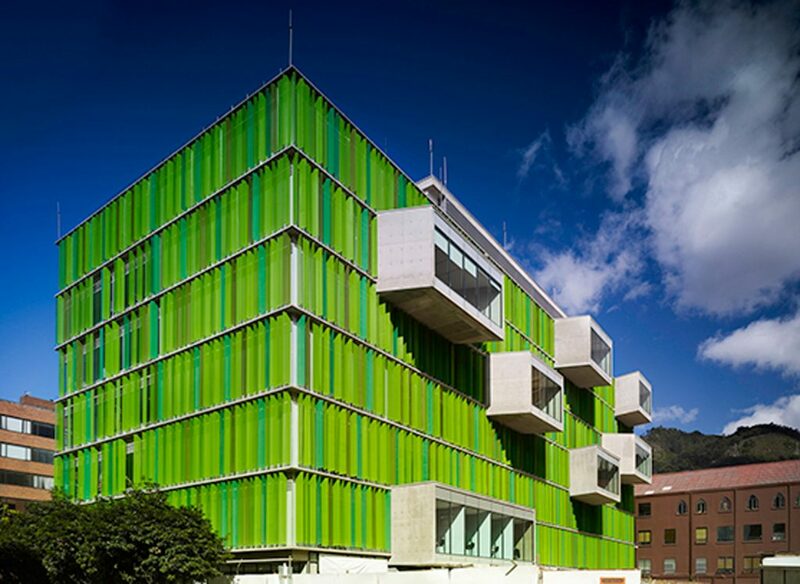 Meanwhile, William McDonough + Partners has designed a 20,000sq m academic building for the Universidad EAN in the urban core of Bogotá, Colombia, in the El Nogal district to reflect the high environmental aspirations of the university. Covering 10 floors of facilities including physics and biology labs, classrooms, admin offices and seminar rooms, it also includes a cafeteria, indoor basketball court, gym and an auditorium seating 500 people. However, the defining element of the design is a sunshade constructed using William McDonough’s WonderFrame technology – perforated, coloured shade panels built into the frame of the structure to block glare and allow views. The building is also naturally ventilated via ‘solar chimneys’, which draw air through the building and expel it through the roof.